The glass history goes back to the beginning of time with naturally occurring glass. 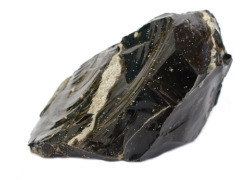 Obsidian, a naturally occurring glass which is created when terrific heat generated from volcanoes causes rocks and sand to combine. Lightning striking the sand and rocks, forming tubes fulgurites and meteorite impacts are two other ways in which glass naturally occurs. Naturally occurring glass is mostly impure and is usually formed in small amounts but it was used during Neolithic times for hunting weapons, jewellery and money. How man made glass was first produced is unclear. Some believe that sometime during the 50th Century BC merchants accidentally made glass when the heat from their beach fire caused a reaction between the sand and their nitrate cargo which they were using to rest their cooking pots on. Glass history can only be traced back to 3000 BC where it was used for glazing pottery in Egypt. There is also evidence that glass was being made at this time in what is now modern day Iraq and Iran and by Native Americans. During the 15th Century BC Egyptian’s started to produce different glass products such as beads, which were highly prized with beads of certain colours being seen as having magical powers. After the foundation of Alexandria in 331 BC the production and trading of glass spread quickly throughout the Mediterranean, however glassmaking was costly and a labour intensive process. This labour intensive process was changed by the invention of the blowpipe. The blowpipe was used extensively in the Roman Empire from the 1st Century BC for 500 years. Glass making developed and the ability to produce transparent glass as well as other techniques were discovered. The process became quicker and cheaper and it became available to the masses. The Portland vase, see right, was made during this time, most probably in Rome and displays some of the different techniques mastered by the Roman glass blowers. The Roman Empire did much to spread glass making and in European countries and as far as China glass objects could be found. Poor quality architectural glass also began to appear around this time. After the fall of Rome in the 5th Century glass production slowed and where examples were produced they were usually less ornate as manufacturers gave up their skills. Islamic chemists feature in the glass history when they started to produce glass of high purity in south west Asia during the 9th Century. Abbas Ibn Firnas (810-887 AD) was the first to produce glass from sand and stones and was able to produce Silica glass and colourless high purity glass. It is also thought that the parabolic mirror is of Islamic origin, being described by Ibn Sahl in “On the Burning Instruments” in the 10th Century. By the 11th Century clear glass mirrors were being produced in Islamic Spain and glass factories were being started in Greece. By the 13th Century Venetian glass blowers, who were based on the island of Murano, for fear of fire burning down Venice developed and perfected Cristallo glass, a near perfect glass which could be blown into intricate and thin walled shapes. They were able to monopolise this technique due to the pure quartz pebbles they used as raw material. The glass blowers of Murano were so valuable to the economy that they were regarded as part of the high classes and were forbidden from leaving the island. Despite this many escaped to northern Europe to open their own glass factories. This led to a blossoming glass industry in Germany and the Czech Republic and as far as the United Kingdom by the 17th Century. Around this time George Ravenscroft (1618-1681) added lead oxide to potash glass to make a heavy clear glass ideal for cutting. Lead glass as it is better known was patented in 1674 and was designed as a substitute for Murano’s Cristallo glass. Later in the century French glass makers developed a technique for producing high quality plate glass for use in mirrors called plate pouring. By the mid 19th Century mass glass production took a giant leap with the invention of the glass pressing machine. The US was at the forefront of this technology and was producing large quantities of inexpensive glass. US companies invented many modern techniques for making window glass and bottles such as the cylinder glass technique. Michael Owens (1859-1923) invented the automatic glass blowing machine which was used in both the US and Europe. By 1920 200 of his machines were being used in the US alone. By 1925 the introduction of gob feeders and individual section machines were being produced which meant greater repeatability and remains the basis for glass bottle production today. Commercial production of flat glass was similarly going through a period of revolution with the introduction of the Belgian Fourcault Process which allowed a continuous sheet of glass to be drawn from the tank with a consistent width. The method was used for the first time in 1914, nine years after its invention. The process was further refined by another Belgian Emile Bicheroux, who developed the technique of drawing the molten glass through two rollers which made the thickness more uniform and the finishing process easier. Throughout the 20th Century more developments such as laminated glass by French scientist Edouard Benedictus in 1910 and the Libbey –Owens method of producing sheet glass in 1917 revolutionised glass production. Developments continued to be made such as the combination of the Libbey-Owens method with the Fourcault processes which was used from 1928. An important part of the history of glass story was when the float glass process, developed in 1959 by Pilkington Brothers Ltd. in the UK, allowed the production of glass with a combination of an excellent finish like sheet glass, with the optical qualities of plate glass. Innovations in glass production continue to this day and insure that the history of glass will be forever changing.